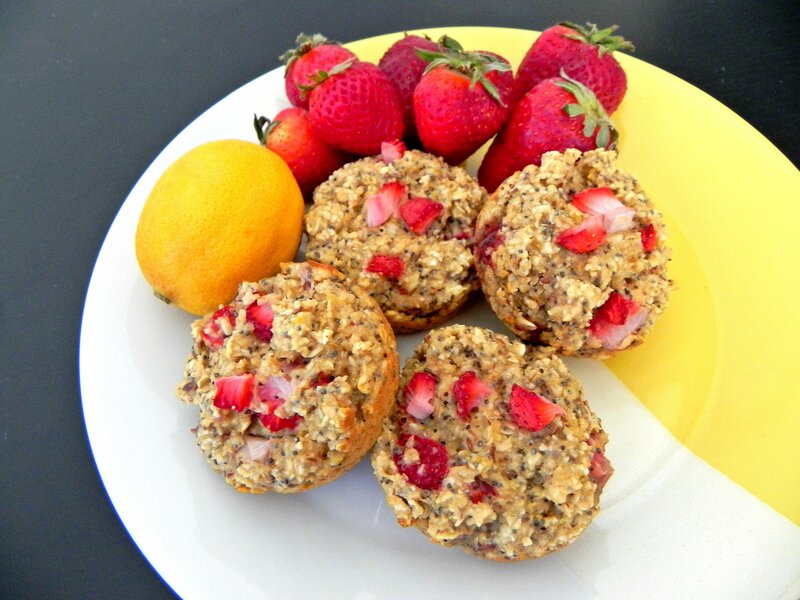 The combination of mouth-watering lemons and perfectly ripe strawberries make these muffins so refreshing and light. Feel free to sub the strawberries for any other berry you like such as blueberries, blackberries, and raspberries. I love making a batch of these in the summer to have with breakfast or lunch throughout the week. Since they are mostly carbohydrates enjoy them with some protein and a little fat to keep your blood sugar stable and balance your meal. Dysphagia Level 1 – Pureed – cook according to recipe and put in a blender or food processor. Blend into smooth, adding liquid as needed. Dysphagia Level 2 – Ground/Mech Soft – When serving, cut 1 muffin into small pieces and allow to soak in milk for a few minutes to soften. Dysphagia Level 3 – Soft – Cook according to recipe. Preheat oven to 350ºF. Liberally spray a muffin tin with cooking spray and set aside. Make flax egg by combining ground flaxseed and water in a small bowl. Set aside for 5 minutes or until firm. Pulse 1 cup of oats in a food processor until a flour consistency is formed. Combine oat flour, remaining 1/2 cup oats, baking soda, baking powder, poppy seeds and salt in a medium bowl. Mix flax egg, yogurt, applesauce, brown sugar, juice and zest of lemon, vanilla, oil and strawberries in a large bowl. Add dry ingredients to wet ingredients and stir until evenly combined. Fill each muffin cavity about 3/4 of the way full. Bake for 20-22 minutes or until toothpick inserted into center of muffins comes out clean.